Emerging economies will be responsible for almost one third of the growth, although they account for just a little more than one fifth of current wealth. Wealth will primarily be driven by growth in the middle segment, but the number of millionaires will also grow markedly over the next five years to reach a new all-time high of 55 million. Despite the turbulence experienced by the global economy during the 2008 financial crisis, global household wealth increased by USD 200 trillion between 2000 and 2018. But what is likely to happen in the near future? We offer a possible scenario by present­ing estimates of total wealth and its distribution across regions in the year 2023. Emerging economies are expected to recover from their recent doldrums and continue to catch up with developed economies. Emerging economies. Set to gain momentum. 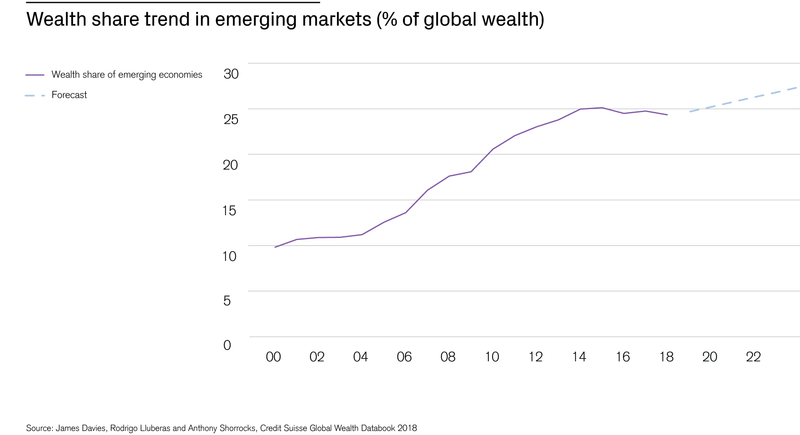 Between 2000 and 2018, emerging markets have more than doubled their share of global wealth from 10% to 24%, but the growth rate has slowed down during the last five years. We now expect emerging economies to regain momentum. The share of global wealth of emerging markets will likely reach 27% by 2023, increasing their share by 0.5 percentage points on average each year. The middle-income segment within emerging economies currently accounts for 21% of global wealth. It is expected that these countries will contribute about a third of wealth growth in the next five years, setting their share of global wealth up to 23%. China, a member of the middle-income group, is expected to increase its portion of global wealth from its current 16% ownership to just below 19% by 2023. The proportion of global adults with wealth below USD 10,000 has decreased since 2000. At the beginning of the century, 80% of global adults belonged to this stratum: today the fraction is 64%. Our projections show it decreasing further to 61% in 2023. The global wealth middle class – those with net worth between USD 10,000 and USD 100,000 – increased from 14% in the year 2000 to 27% today. By 2023, it will grow to reach 29% of all global adults. The upper middle segment, covering those with wealth between USD 100,000 and USD 1 million, will grow by 88 million adults between 2018 and 2023. About one in ten adults will then belong to this group. According to our estimates, the number of global millionaires will exceed 55 million in 2023, a rise of almost 13 million compared to today. The catch-up of emerging economies is also evident in the increasing proportion of global millionaires. While million­aire numbers in emerging economies are still far below the levels in the United States or Europe, they are expected to increase rapidly in the next five years. China, for example, is set to see its number increase by 62% to 5.6 million, retaining second position in the millionaire league table ahead of Japan, the United Kingdom and Germany. India could host 526,000 millionaires in 2023, an increase of more than 53% in the next five years. 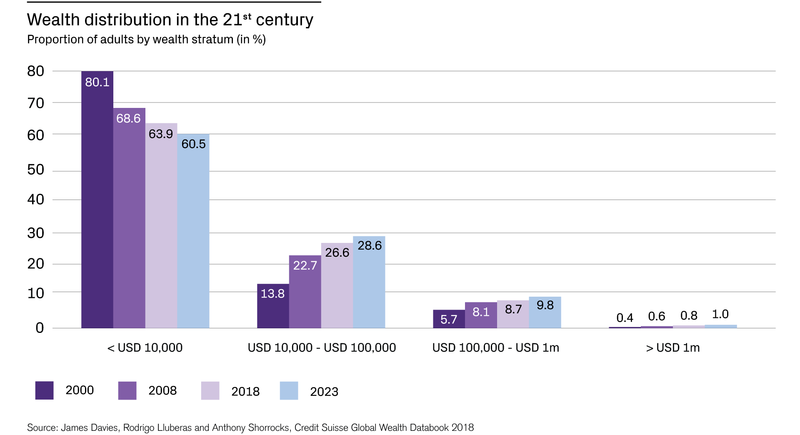 The ninth edition of the Global Wealth Report published by the Credit Suisse Research Institute provides the most comprehensive and up-to-date source of information available on global household wealth. The Global Wealth Report is compiled from data on the wealth holdings of 5 billion adults – from billionaires in the top echelon to the middle and bottom sections of the wealth pyramid. The robust methodology, established over many years of analysis, provides transparent information on the Global Wealth Report's underlying sources and their quality. China now dominates the middle class segment worldwide and has vastly increased its number of ultra-rich individuals by 200 times since 2000.